EP AND MUSIC VIDEO "YOU" TODAY! 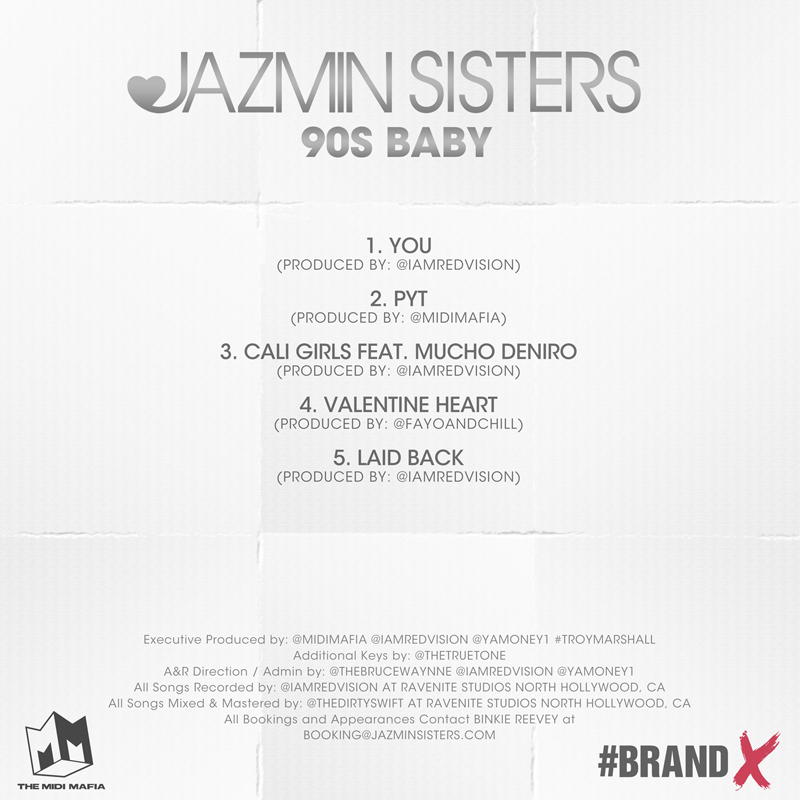 November 11, 2013 – Today, LA-based JAZMIN Sisters premiere their debut EP 90's Baby with VIBE Magazine. The four Chinese-American sisters have partnered up with Grammy Award winning producers, MIDI Mafia, who are not only executive produced the project, but are also releasing the EP on their emerging artist platform Brand X Networks. 90's Baby production re-interprets the sisters' favorite classic R&B jams. The project's first single, "You", flips SWV's "Weak," into a danceable ode to new love layered with the group's signature four-part harmonies. The video for "You" is a nod to both 90's hip-hop and girl groups of the past made fresh by the producers' modern touch and the sister's easy chemistry. "When we began working with MIDI we were able to be ourselves for the first time in music," describes Felicia of JAZMIN Sisters. "They shared our love for Hip Hop and Motown, so 90's Baby is a dream come true. We can't believe it's finally here!" The EP manages to be many things at once. 'Cali Girls' celebrates a life of sunshine and parties without being overpowering, while the group's oldie and Motown roots burst out on 'Laid Back', a track that grooves along to the story of the girls growing up together and following their passion for music in to adulthood. MIDI Mafia has struck #1 on the Hot 100 three times. They pride themselves on tapping into talent early in their careers as seen on collaborations with 50 Cent (Get Rich Or Die Tryin), Frank Ocean (Nostalgia Ultra) and Justin Bieber (Never Say Never). This year, the producers launched an all-encompassing music platform that creates partnerships with hot new talent for production, marketing, distribution and licensing deals. The produced content is hosted on Brand X Networks website: www.brandxnetworks.tv and YouTube channel www.youtube.com/brandxnetworks. "The girls gave us that gut feeling that we get when we know something is special," explains Bruce Waynne of MIDI Mafia. "They're hard workers and not afraid to try new things. They have all the ingredients of what superstars are made of." The 90's Baby project comes on the heels of increasing hype from big names in the music business. The JAZMIN Sisters were finalists on MTV's Top Pop Group premiere season, earning praise from the likes of Michelle Williams and Eve to acclaimed choreographer Brian Friedman. They moved on to become finalists on America's Got Talent and appear on NBC's Star Tomorrow. Their cover of the Jackson 5's "Who's Lovin' You" has over 900,000 views on YouTube. Raised in a strict household that only allowed Motown, oldies and the like, sisters Nadia, Felicia, Celia and Daria banded together from a young age to sing and dance. Each sister brings something unique to the group, but their voices blend effortlessly into the lush harmonies their fans have come to love. With the release of '90's Baby', they are ready share that sound with the world.